Short-tailed Albatross feeding chick on Midway! More info since the first announcement! The first nesting of Short-tailed Albatross outside Japan. A pair of birds nested for the first time. Here is the video from January 28, 2011. If I understand correctly, another nest on nearby Kure Atoll was evidently tended by two female Short-tailed Albatrosses and the infertile egg never hatched. The 2011 ABA Pelagic Directory is now available online as a pdf. In years past this directory was published in the January Winging It newsletter, and mailed to all ABA members. However, for the past couple of years it has been online only. This issue is very nice, listing 49 pelagic opportunities around North America--from Nova Scotia to Florida, and California to Alaska. It is "decorated" with some amazing seabird and marine mammal photos, along with a couple of boat photos. 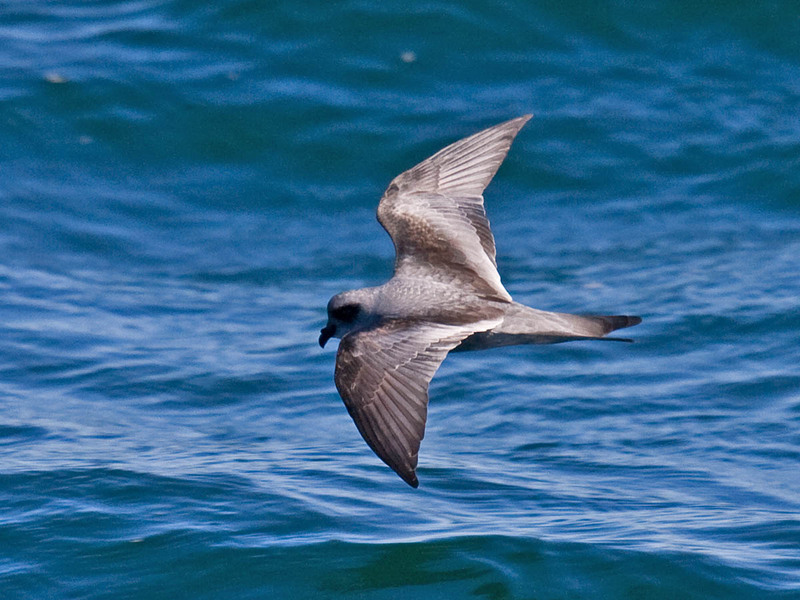 One of the photos is the one above of a Fork-tailed Storm-Petrel I took on September 11, 2010 off Newport, Oregon. 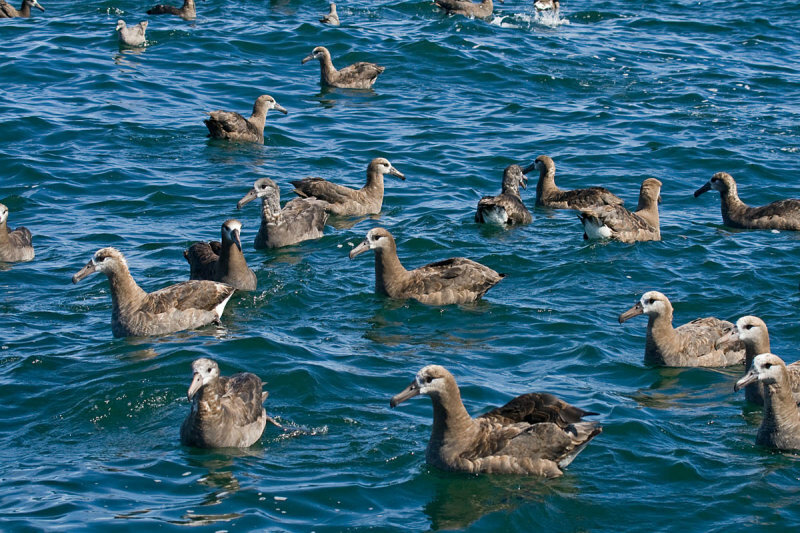 Some of the 135 Black-footed Albatrosses, off Newport, Oregon on 11 September 2010 by Greg Gillson. Thirty miles off the Oregon coast Black-footed Albatrosses gather every summer to feed in the rich California Current. They come from far away across the sea. Far, far, away. Many of the Black-footed Albatrosses off the coast of the Pacific NW come from remote islands such as Laysan, Midway, and the French Frigate Shoals. It is approximately 2500 miles SW from the Pacific NW coast to Honolulu, Hawaii. From there it is another 560 miles NW to Tern Island, French Frigate Shoals. This coral atoll is the worn down top of an ancient volcano. The waves wear down the volcano until the top is under the water. Coral grows up to the surface, detritus and flotsam get caught in the shallows and an island is formed,... barely. Because the waves tear it down again. But there, 3000 miles from the cold and rainy Pacific NW, on warm sandy beaches, Black-footed Albatrosses come ashore to breed in December and January. There they raise their single chick until May, then they strike out eastward to the continental shelf of western North America to feed in the cold, productive waters. Even out in the middle of nowhere, there are biologists working on these remote islands to catalog the endangered wildlife. 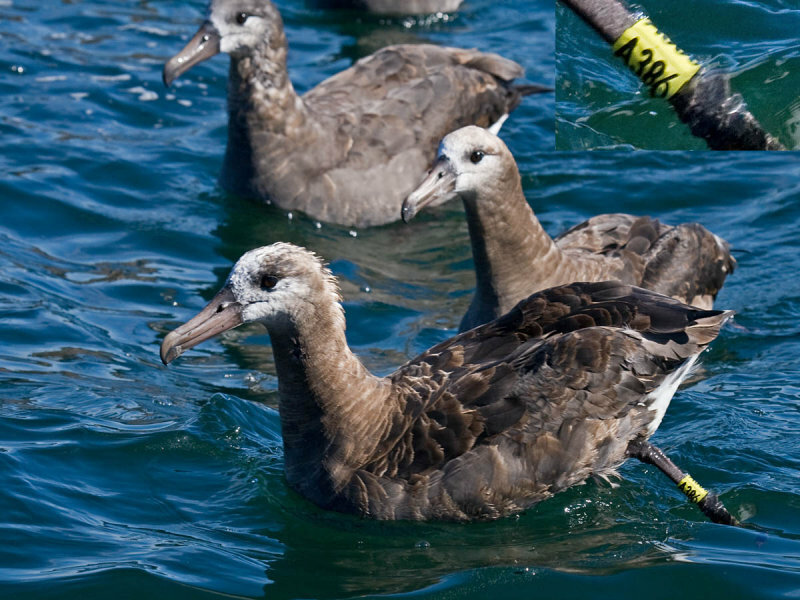 Thus, many of the albatrosses we see off the Pacific NW in summer and fall had been banded as chicks many years before. These carry a metal US Fish & Wildlife band and a larger plastic band with easier to read larger numbers. On an offshore birding boat trip this fall we found one such banded bird. It wore a numbered plastic leg band. One of our passengers was able to get a photograph of it and sent it to me. 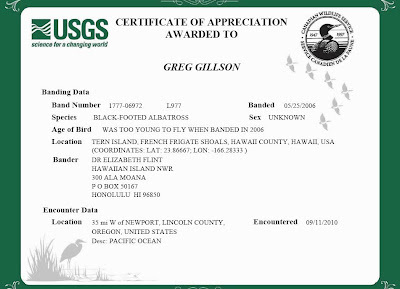 I reported the number to the Bird Banding Laboratory and received the thank you acknowledgement below. Then, going through my own photos, I found I unknowingly took a picture of another albatross with a different band number on it. This, also, I turned in, but have not yet heard back. If I had turned in the number on the stamped aluminum band I would have gotten an answer directly from the US Fish & Wildlife Service. But the colored leg bands are only tracked by the research scientist. The researchers put both bands on, but the aluminum one is the official band, but harder to read. So, I haven't heard anything about the bird in the photo below, but expect it has the same story as that detailed in the acknowledgement above. Black-footed Albatross with band A386, off Newport, Oregon on 11 September 2010 by Greg Gillson. 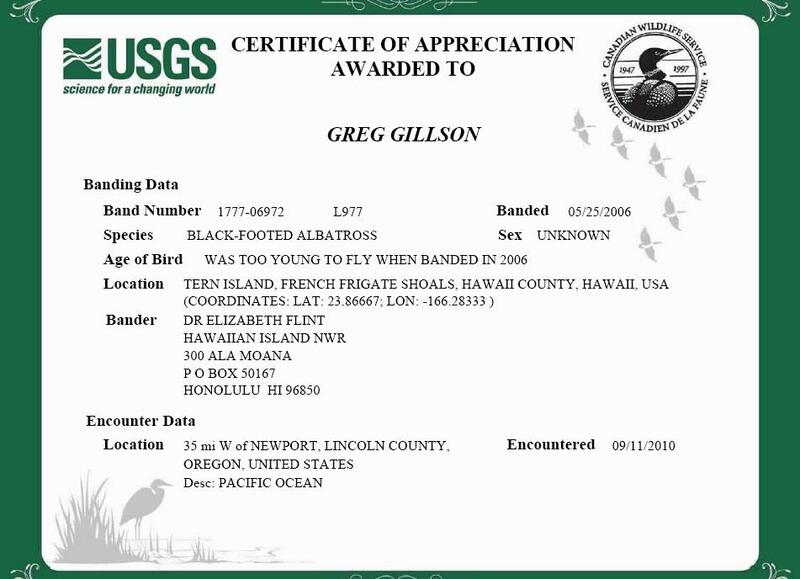 To report a color-marked or birds banded with aluminum band (except domestic pigeons), record the number and report the number on : this web site.